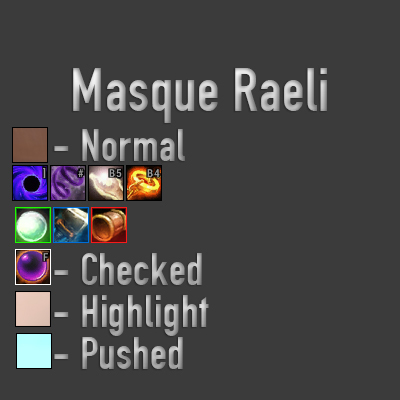 Masque: Raeli is an add-on that adds a skin for Masque. It includes one skin, which has a simple 1 pixel black border. The checked texture has a slight highlight, though this can easily be disabled by setting the checked transparency to 0 in the Masque settings. Items have a slight internal glow to them that makes it easier at a glance to see item quality.